Two teachers left their world behind for a six-week trip they'll never forget! A pair of New York teachers channeled #VanLife when it came to their off-the-beaten-path summer vacation. 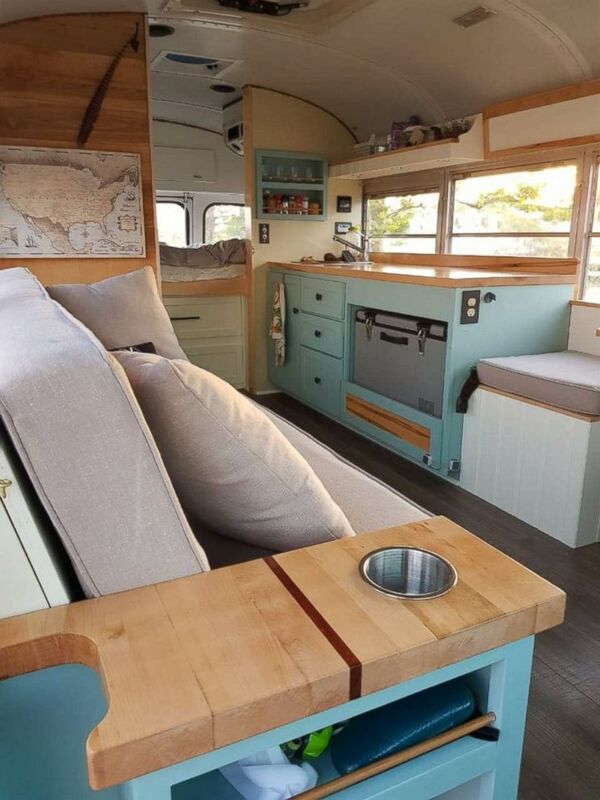 The couple purchased an old school bus, completely renovated it themselves and then hit the road with their beloved dog on an epic, six-week road trip across the country. 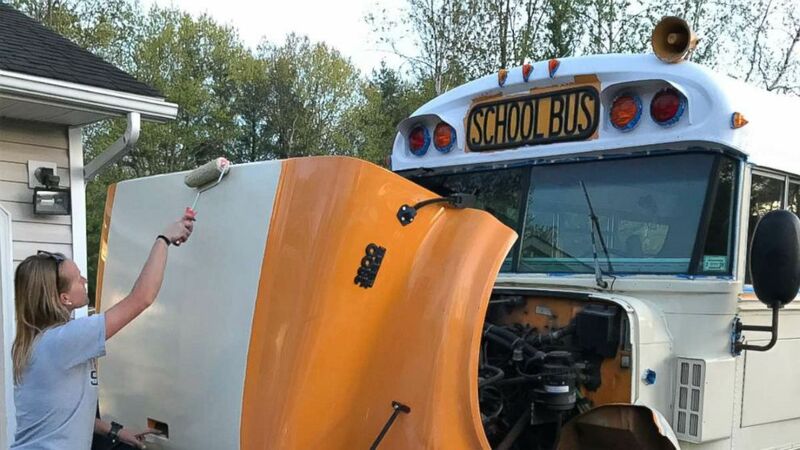 For Andrew and Steph MacArthur of Greenwich, New York, the journey started in October when they purchased an old school bus and started to transform it into their own DIY RV. They added a refrigerator that runs on solar power, a full living room-style spread with a cozy couch and reclaimed wooden countertops among many other improvements. Throwback to October 2017 when we purchased this bad boy! At the end of June, they set out in their tiny home on wheels to see the great outdoors and have enjoyed the good life on the road -- fishing, camping, cycling and exploring as much of this country as they can. The two had always been interested in the tiny home lifestyle taking the nation by storm, even though the couple own their own home and won't be doing this full-time. (summerskoolielife/Instagram) Andrew and Steph MacArthur converted a school bus into a RV. "[This trip is] really to explore this alternative lifestyle," Andrew said. "The students have been very curious about this and the topic of future has come up a lot," Steph said. "The kids are wondering, 'Do I have to go to college, do I have to buy a 3,000-square-foot house and have 2.5 kids [to be happy]?'" Before and after! #rusty sure has come a long way ???? Your dog, your partner in crime, and the open road ?? #lifeisgood ————————————————— If we were professional #vanlifers or #bloggers this is most likely the only caption that would be written in this post. Lucky for you, we’re not that, and we don’t like to sugarcoat things. Last night we almost drove off the road due to a sudden unpaved road change, discovered that we’re only getting 8 miles to the gallon ??? ?AND almost ran out of gas....whoops! We worked together to figure it out, embraced after a scary moment, and kept on driving. We’re getting used to the ins and outs of the bus and learning with each pit stop. Traveling isn’t always easy, but it’s definitely worth it...and all you really do need is your dog, your partner in crime, and the open road ?? Along the way, the MacArthurs' eyes have been wide open. They've made some amazing friends, who are living their truth and are breaking the conventional career path. "We've had some amazing answers. The ones that stuck out to us, are 'Don't dream, live!'" Steph said, adding, "Don't just sit on Instagram wishing you could do all these things people are posting about." She said that while it might be nice to see what your favorite Instagram influencers are up to, think abut what is actually feasible and what matters most to you and give it a shot. "If you actually want to do it, just go do it!" she said. 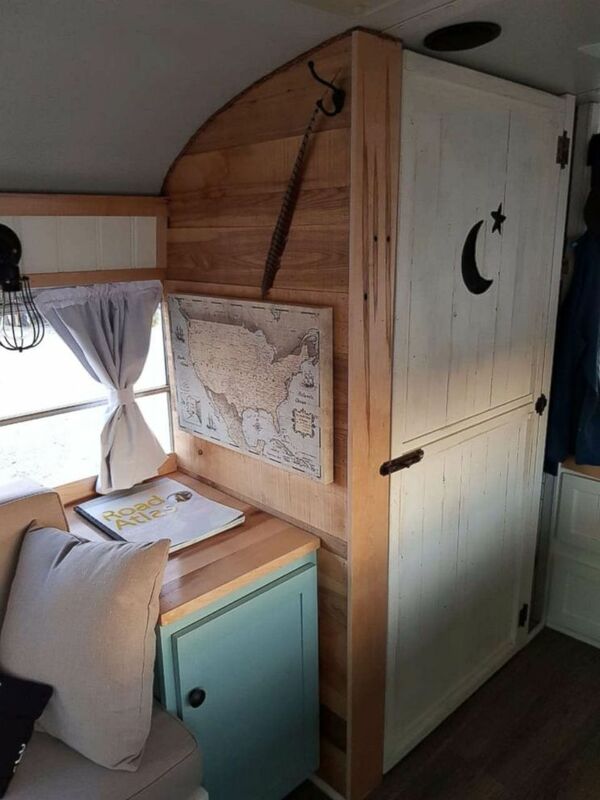 (summerskoolielife/Instagram ) Andrew and Steph MacArthur converted a school bus into a RV. The couple added that another lesson they can't wait to share is that if you want to see more of the country and not live tied to a desk, you have to figure out the balance in life, which may mean giving up things like a large home or putting down roots in a community. "When we talk to kids, we are always talking about what you want to do but we never talk about what scarifies you are willing to make," Steph said. "What can you live without?" Andrew said one couple they met decided to think about what they wanted to prioritize and "what makes us happy?" "What passions do you have and pursue those first and foremost," he added. "The rest will fall in line, but you might have to make sacrifices to make that happen." Andrew said they met a few people who either came up with their own business while on the road, or just simply asked their job if they could work remotely, something that is becoming more popular as digital jobs continue to grow. "There was this guy we met on the road, selling crystals out of his RV and making good money doing it. He was saying, people laugh at him now, because he was in private business and making a lot more money before this. And people who have known him for awhile, would ask, 'What are you doing?'" he said. Mount Rainier National Park was a bit crowded on Saturday afternoon, but a short walk from the car left us practically alone. We walked along wild flower meadows, across snow fields, and next to glaciers. What a beautiful place! But Andrew added that this man countered with, "Listen, I have to work three months out of the year, then I travel the rest of the year.' ... He also said, 'I'm sick of hearing about people's dreams, you just have to 'do.' ... Put yourself out there and take the step, take action.'" The MacArthurs said if you have a dream, you'll never know if it works until you try!